Tapioca makes this easy-to-prep chocolate pudding super-rich and creamy. Serve warm or chilled. Either way, it's delicious. Beat egg, milk, sugar and tapioca with wire whisk in medium saucepan until well blended; let stand 5 min. Add chocolate. Bring to full rolling boil on medium heat, stirring constantly. Remove from heat. Stir in vanilla. Cool 20 min. (Pudding thickens as it cools.) Stir. Serve warm or chilled. Stir before serving. Prepare as directed, adding 3 Tbsp. peanut butter with the chocolate. 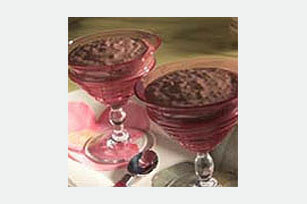 Prepare as directed, decreasing BAKER'S Semi-Sweet Baking Chocolate to 2 oz. and stirring 1 cup JET-PUFFED Miniature Marshmallows and 1/3 cup chopped toasted PLANTERS Walnuts in with the vanilla. Prepare as directed, substituting 1/3 cup of your favorite flavor MAXWELL HOUSE INTERNATIONAL for the BAKER'S Semi-Sweet Baking Chocolate and decreasing sugar to 1/4 cup.